The Royal Commission into Institutional Responses to Child Sexual Abuse (Royal Commission) was established in response to allegations of sexual abuse of children in organisations that had been emerging in Australia for many years (Royal Commission Final Report 2017). At the end of the 5-year enquiry, the Commissioners had listened to the personal stories of over 8,000 survivors, read over 1,000 written accounts and reviewed allegations of child sexual abuse in more than 4,000 institutions. Organisations have failed to keep children and young people safe in their care. The Royal Commission found that “the sexual abuse of children has occurred in almost every type of institution where children reside or attend for educational, recreational, sporting, religious or cultural activities” (Royal Commission Final Report 2017). A culture where the best interests of children were not a priority. The Royal Commission resulted in 409 recommendations to make organisations safer for children. So, what makes an organisation child safe? Child safe organisations create cultures, adopt strategies and take action to prevent harm to children and young people. responding appropriately to disclosures, allegations or suspicions of harm. The Royal Commission has recommended that all organisations that have any contact with children must be compliant with 10 National Child Safe Standards (the Standards) as outlined in Volume 6, Making Institutions Child Safe. 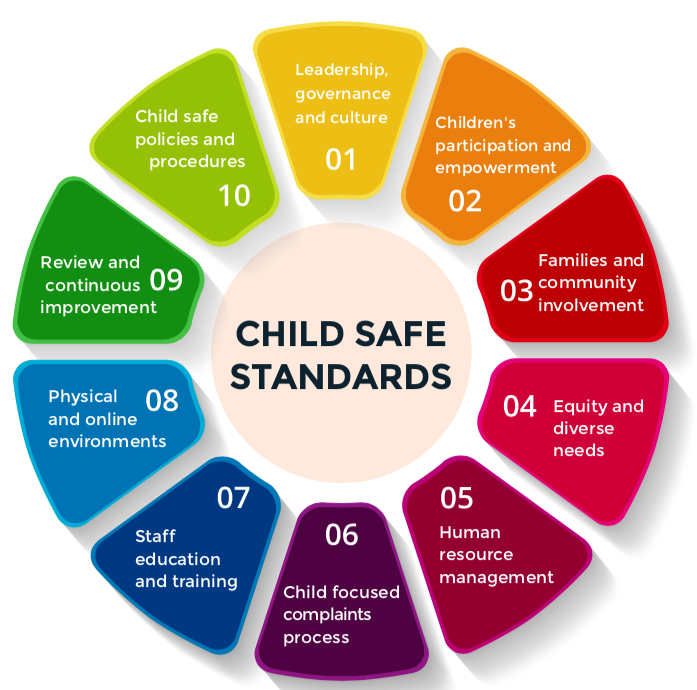 The Standards are a benchmark against which organisations can assess their child safe capacity and set performance targets for a best practice approach to child safety. The Standards are interrelated and work together to articulate a holistic approach to child safety. There are necessary overlaps between the Standards and they can be implemented alongside other standards. The risk of child abuse varies from one organisation to another. Therefore, every organisation needs to consider each standard and take time to identify risks that may arise in their context and find ways to mitigate or manage those risks.